Graphic design as it applies the Wenex Media Works stable of services is the development of visual communication through the effective use of typography, space, imagery, and colour. Common uses of our graphic design include business identity (logos and branding), publications, various marketing materials, and website graphics and elements. Developing creative visuals for electronic media requires attention to a specific set of requirements, such as how colours are interpreted by various displays, or how elements will scale from a large screen to a mobile device. 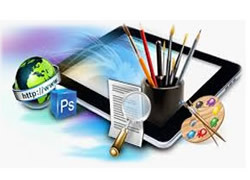 Wenex addresses these requirements during every project that involves digital design work. Our electronic media expertise covers a wide range of applications, including web site design, digital advertising development, downloadable media (such as PDFs), and online presentations. We can also assist in coordinating with suppliers who can provide printing services offering the best combination of efficiency, quality, and value.